I just got back three days ago from Europe, where my husband and I spent a month traveling by plane, train, car, and bus across four geophysical zones. Twelve days of the trip were spent in Greece, a country I've visited twice now. Since Easter is coming up and Greece is on my mind, I wanted to create a Greece-themed Easter dish to share on the blog. Delving a little deeper, I discovered that many different European countries make yeasted, sweet braided bread decorated with coloured eggs for Easter. There are a few common denominators, which I've shared below. 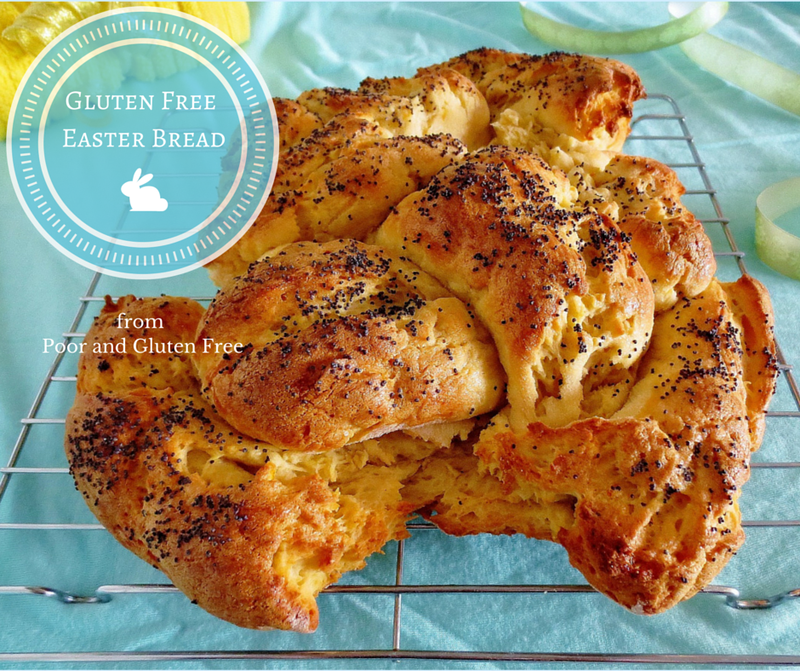 I've also, of course, shared a new version of gluten free Easter bread, a little different from the one I made last year. 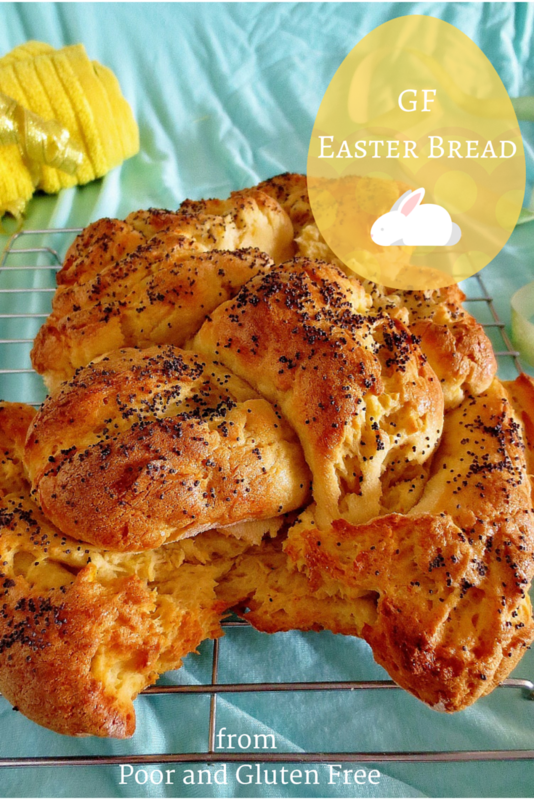 How common is sweet braided Easter bread? Sugar, eggs, egg wash, and butter. Usually there is also a bit of citrus (orange or lemon peel), vanilla, and anise or something similar. As far as I can tell, the differences are minimal, and just involve slight differences in braiding and shaping. I've seen a variety of explanations for the braiding, the eggs, the colour of the bread, etc., so here's a really basic rundown. I'm not terribly religious myself (more of a spiritualist), but it was interesting nonetheless to see the symbolism that can go into making a loaf of bread. I've seen some say that the white bread represents the holy spirit, that if the eggs are dyed red it's the blood of Christ, that the braid represents the holy trinity, and so on. But whether you inject some symbolism into your bread or not, it makes a lovely centerpiece and is super tasty. So whether you're religious, or not, North American, German, Greek, or from wherever, you might want to give this bread a try. To rise once or twice? 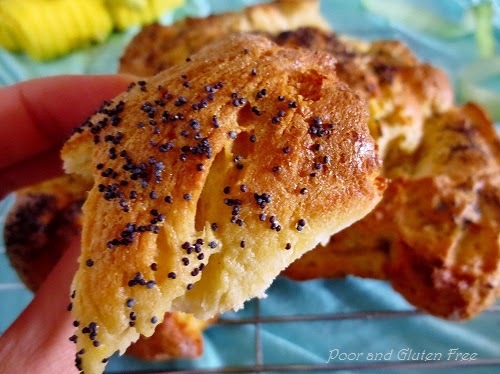 As a hint for those who may have tried making bread like this before, one thing I've discovered is that gluten free bread doesn't do as well if it's twice risen. Generally with glutinous breads you let the dough rise once, then punch it down and shape it, and let it rise again. I've tried this with GF breads both ways and have found that just shaping and rising once makes for a lighter, softer bread vs the twice-risen, which doesn't rise as well. 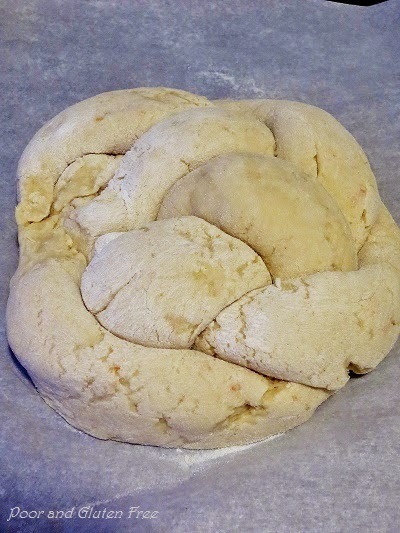 Yes, it can be just a little bit harder to shape the dough if it hasn't risen (GF bread dough is usually goopier than glutinous), but by kneading in just a wee bit of flour and only kneading the dough 2-4 times, it can be quite workable, as is the case with this braided bread. Nice and fluffy and porous. Here's a quick picture tut so the directions make more sense. Because you're going to divide it into three, and knead just a teeny tiny bit of flour into each portion, just enough to make it smooth. Then you're going to roll each piece out about the length of your baking sheet. Now you can wrap this around, tuck the ends together, and make a circle, but mine rose so much it split apart. I think if you want to make a braided circle, it's best to divide the dough into 6 parts and make 2 small braided circles. OR you could just make one large braid (as above) and leave it without making the circle. Of course, busted open or not, it still looks pretty decent and tastes awesome. So it's a matter of preference, really. Cover and let rise, then brush with egg wash and bake. The egg wash helps give it a lovely brown, crispy crust. 1. In a medium sized bowl, mix together milk, yeast, and sugar. Set aside to proof 5-7 minutes. 2. Whisk together flours, starch, gum, salt, orange zest, and anise in a large bowl. Set aside. 3. Whisk together eggs, vinegar, vanilla, and butter. Remove 2 Tbsp of mix, add an equal amount of water to it, and set it aside (this will be your egg wash for later and will give you a lovely brown, crispy crust). 4. Into the flour mix, add egg mix and yeast mix. Beat 2-3 minutes, until smooth and goopy. 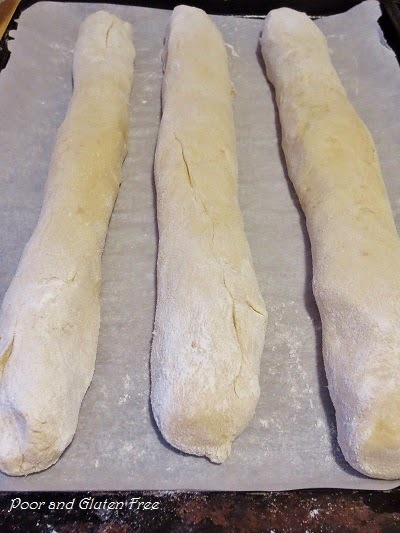 Divide dough into 3 equal portions. 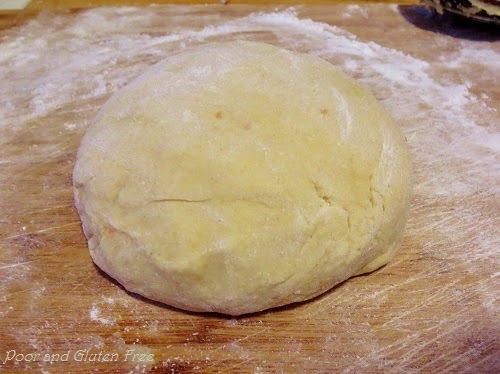 OR make two small rings by dividing the dough into 6 pieces and making two braids. Dust a flat surface with sweet rice flour and turn one piece of dough out onto it. Dust with more flour and knead 3-4 times, just enough to make dough less sticky and more workable. DON'T over knead or add a lot of flour, this will make your dough heavy. You want just enough to make it workable. 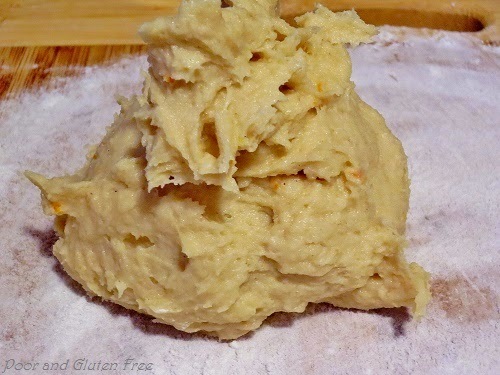 Roll dough out into a rope about the length of your baking sheet. Repeat with remaining pieces, and remove to baking sheet. 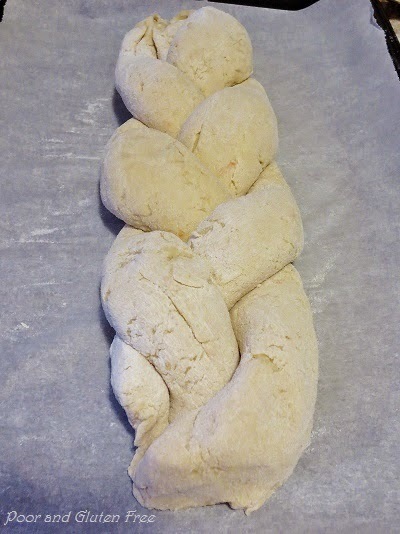 Pinch ends together and braid dough. Don't pull or stretch the ropes, they'll be more likely to crack. Cover with a clean dish rag and set in a warm place to rise for 30 - 45 minutes, until doubled in size. 5. Heat oven to 375F. Brush bread with egg wash and sprinkle with optional toppings. If desired, you can press coloured, hard boiled eggs into the braid now for decoration. Bake bread 20-30 minutes, until golden brown and cooked through. Remove from oven and cook on a rack. 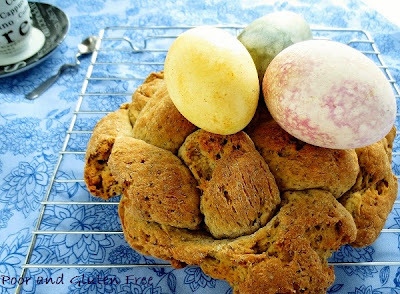 Do you have a favorite Easter bread, or an unusual Easter tradition? I hope you'll write about gluten free in and across Europe! We're in the beginning stages, but everywhere but Italy seems scary to this celiac! -Amanda Y.
I certainly intend to write about it! I'm sorting through photos, etc., but I can say that I had excellent luck everywhere we went, including Greece, Italy, France, and Scotland. We did stay mostly in large cities (except in Greece, where we did stay in a couple of small towns, and still had decent luck). For quick tips, though, I definitely recommend doing some self-catering (it also saves money on lunches, etc!). Check out the local supermarkets, as almost everywhere I went had a GF section (!!!) with bread, buns, etc., and print out some gluten free travel cards in the languages of the place you're going to (I got mine here: http://www.celiactravel.com/cards/). These are super helpful in restaurants, and all the waiters I gave them to were very kind about it. I think they actually found it informative, and several took the cards to the kitchen for the chefs to look over. Danielle thank you for this amazing recipe! What a great idea about printing off the gluten free cards in the different languages to give to waiters. Traveling internationally is a big stressor for me with my food allergies so this is a lifesaver! Yippee! ;) Thank you!! You're welcome! I've used them a few times now and they've been super helpful :) I actually copied and pasted them into Word, shrunk them down to wallet size, and printed them on slightly thicker paper so they survived the trip really well. Your bread looks so good Danielle!!! Too bad I can't have yeast. But I bet your bread tastes as great as it looks! 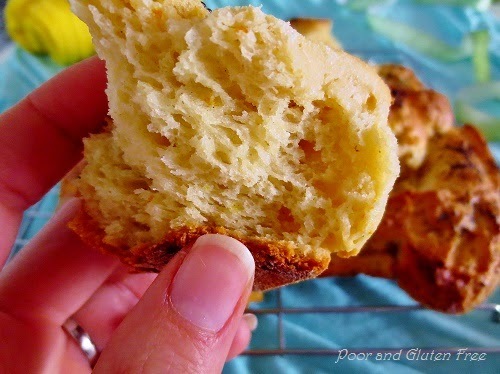 I'm fairly new to the gluten free life, and haven't really ventured into yeast bread, yet - but I baked Easter bread for years, and so that's on my list for next year. (I figured I should master yeast bread before I fool around with *braided* yeast bread... LOL) Seeing your success is heartening. Hi Anne, I don't see any reason really why this wouldn't work as a regular loaf (although the baking time might need a bit of adjustment), but if you're looking for a good yeast loaf recipe I do have this great Multi-grain multi-seed sandwhich bread that I absolutely love! Thanks so much for sharing, April!